How and when did you first become interested in birds? One of my classmates in second grade gave a presentation on penguins, and despite including a range map, I looked for them in my backyard. While searching my backyard I noticed a Red-tailed Hawk in the oak tree behind my house and asked my mom for help in identifying the bird. This was my spark bird! After this, I spent a lot of time as a kid in my backyard and the Cuyahoga Valley National Park identifying trees, wildflowers, and wildlife and loved flipping through my Sibley guide my parents bought me, wondering how many of the species of birds might have passed through my backyard at one point in time. I may or may not have began conversations with friends growing up with, “so, have you seen any wildlife lately”? I also loved the hidden knowledge that CVNP [Cuyahoga Valley National Park] rangers, Ted Williams seasonal natural history column in Audubon magazine, and local naturalists had about natural history. They seemingly knew about all these incredible processes and local species distributions, and really knew the story and dynamics of a landscape. I still feel this as a 29 year old Master’s student working with the American Woodcock, a species which is incredibly easy to mistake as being part of the forest floor, and is often overlooked except for those who are familiar with their natural history. When and why did you first become interested in woodcock, and this study specifically? One of the first woodcock I saw as a kid was a bird migrating between buildings in lower Manhattan on a family trip in eighth grade; a highly unpredictable landscape for any bird to navigate. For many shorebirds, including woodcock, I’ve always been interested in how shorebirds find suitable stopover habitat, what decisions they make during migration, and how they handle the unpredictable nature of finding suitable stopover. Although woodcock have been mostly studied from a perspective around habitat selection, woodcock are a really interesting system to study migration especially as there are populations which are migratory, non-migratory, short and long distance migrants, counter to most birds they have a prolonged spring migration in comparison to a rather quick fall migration. They also are really unique in that they have assumed a migratory behavior by tracking the invasion of non-native earthworms after the glacial retreat extirpated native earthworms from the north, which always blows my mind. What interesting things have you found out in your research so far? Preliminarily, using data from my first field season, it seems that woodcock can make quick migratory leaps often travelling 400 miles in a night, or using one stopover site before arriving at their wintering grounds, as well as woodcock left Rhode Island anywhere from early November to early December. In addition, it seems that birds from higher quality habitats tended to migrate earlier than birds from lower quality habitats and are mostly wintering along the coast, anywhere from Connecticut to Alabama. What excites you most about your current research? What excites you most about Woodcock? I think what’s exciting to me is how many unexplored questions there are for something that is seemingly so well studied, and especially how strange woodcock are as a system. For instance, woodcock are a really interesting system to study breeding behavior as they exhibit reverse sexual dimorphism [females are larger than males], are polygynous [1 male mates with multiple females], and fly to fields to perform aerial courtship displays. Due to woodcock displaying in the evening (making them difficult to see), little is known about the presence or absence of females at each singing ground, male breeding success depending on site quality, the birds condition and, age and how breeding intensity and behaviors change over the course of the breeding season. This has implications in understanding which males are most or least likely to mate, and how females choose which display site to breed at, and there’s a ton of room to look at ethology in these birds. Or the fact that they are shorebirds that spend most of their time in forests. I also love how dynamic they are. When tracking them over the summer, it would seem that just when you think a particular woodcock has settled into a location, the bird would move to another habitat within a landscape, especially as the water table drops in summer. 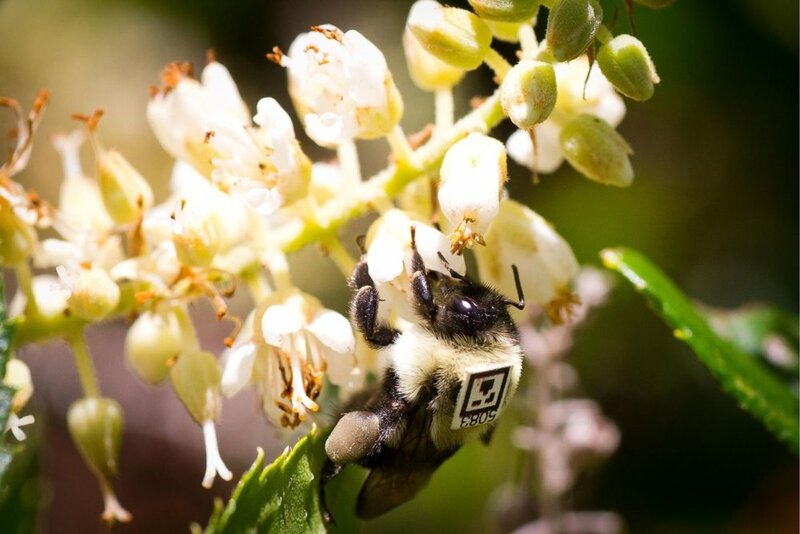 It’s also really exciting to be working with novel tracking technology, and to hope that information from my research will be able to contribute to broader scientific discussions and management plans for woodcock. Could you describe what a typical day in the field is like? [In the spring Clay catches individuals for the first time]: Depending on cloud cover and the moonphase, right at about 18-25 minutes after sunset, (or often I used when I can’t see details such as hairs on my outstretched hands or the print on a piece of paper), woodcock start ‘peenting’ and flying to fields to perform their aerial displays. I then usually wait until I see the poles wiggle a little bit, or an absence of displays to check the nets indicating that a bird might be in my mist net. Sometimes we have to use speakers of ‘peent’ calls to catch woodcock as a last resort, as well. My summers are spent tracking spring caught birds that had radio-transmitters attached to them, through swamps and thickets and scrubby habitat. This is in an effort to identify their diurnal [daytime] foraging locations, in order to build summer home ranges. Woodcock can be anywhere from deep, deep forest to industrial sites and peoples backyard, and some will periodically change their diurnal habitat. Sometimes you are walking through forest and wading through creeks for an hour to reach a bird, while other times the bird is right beside a road and take about two minutes to find and gather a location: each bird seems to have their own story. What difficulties did you run across in your research? How did you surmount those challenges to reach your current insights? Fall this year was pretty challenging in that I wasn’t sure I would be able to recatch woodcock I tracked over the summer in order to replace their radio-transmitters with GPS tags. The first two weeks of September I spent trying to catch a female I tracked over the summer, which loved to roost in log landings that had been clear-cut with intact logs and briars. I never caught this female as it was in too difficult of an area to catch it, but after moving on to other birds I tracked over the summer, I managed to catch 9/12 birds that had transmitters on them. We tried all sorts of deigns and tactics, but what eventually worked best was to capture birds on nights with no ambient light where it was raining, using a speaker to make background noise to cover up my footsteps and to have three people tracking the bird to pinpoint it’s exact location and stop the bird. If conditions were right I would stay out all night to catch several birds, especially as September is the driest month, I had to be efficient with the best conditions for catching. What happens next? What still needs to be studied, and where will the research go next? The hard work is done for this field season, with the Argos satellites doing much of the heavy lifting by downloading and sending information from our GPS tags. Winter will consist of entering data into GIS, and beginning some preliminary analysis of homeranges, and habitat selection. Next field season will be much of the same except I would like try to and catch more birds, as well as create a resource selection function for nocturnal roosts. Anecdotally, it seems that birds are highly selective with roosting locations, and yet incredibly varied. This fall I encountered birds roosting next to rivers in open grassy floodplains, open fields, under holly bushes in clear cuts, along old abandoned roads in pepperbush thickets and in wetlands that were no longer inundated with water. We need to have a better understanding of roost site selection, as the lack of open fields and disturbed locations for roosting and breeding is one of the main reasons woodcock have been in decline. Why is your research pertinent beyond informing us about the habitat woodcock need? Woodcock have been found to be representative species of early successional [young forest] habitat, a critical and declining habitat throughout New England. As forests mature and humans limit their disturbance in New England, no longer clear cutting forests to maintain agriculture, the habitat and species associated with early successional habitat have similarly declined. Conservation of woodcock by proxy also conserves declining species like Wood Turtles, New England Cottontail, and many migratory species of birds which use early successional habitat for both nesting, and providing food for nestlings, as well as adds diversity to a largely monotonous landscape. Is there anything else you would like to say? Are there any questions you would have liked to answer that I didn't ask you? 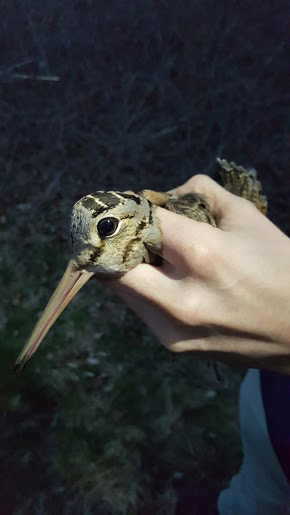 As part of a multi-state collaboration, URI has been working with the Eastern Woodcock Migratory Research Project, to understand eastern woodcock migratory movements. Nesting up North: the Ups and Downs for migratory songbirds. If you’re an avid follower of the “Living with Change” blog (and let’s be honest: who isn’t? ), you have probably read a lot about bird migration. There are so many incredible facets to this topic, as covered wonderfully by Clara Cooper-Mullin in her recent post. The great thing about bird migration in particular is how extreme it can get. A large portion of the songbirds that breed in North America winter somewhere in the tropics and then migrate to lush breeding areas throughout the lower 48 and southern Canada. We know the basic advantages of migration for birds, chief among them the chances for more food and nesting resources. But what about the birds that go way up north? Why go the extra mile (in this case, the extra 1,000 miles)? What about this far northern environment is so enticing to many migratory species? And what kind of changes is the north experiencing that could greatly impact these animals? I was fortunate to study this very topic while working in the Canadian subarctic this past summer outside of Churchill, Manitoba. This research camp has been studying nesting colonies of Lesser Snow Geese for 50 years, and has discovered a plethora of fascinating environmental, climate, and population dynamics that have impacted the tundra significantly. The most dramatic and significant impact on this ecosystem has been the habitat degradation caused by booming snow goose populations (think Canada geese pooping and eating people’s lawns but way worse). Additionally, climate change is steadily altering the landscape on the tundra as well. Willow and birch shrub continue to creep north each year, changing habitat from grassy tundra with minimal willow to shrub-dominated river and tidal zones. My research interest was focused on the impacts of this habitat degradation to the community of songbirds that nest in these areas. Specifically, I was interested in the nesting success and nestling growth rates of Savannah Sparrows that bred in two different northern habitats: areas degraded by geese and healthy coastal areas that have not been impacted by snow geese. Savannah sparrows are the perfect species to study in such environments. They are a relatively generalist species when it comes to nesting sites, they have multiple populations that stretch from the arctic to the Midwestern U.S., and their breeding behavior has been studied on the tundra, in grasslands, and in coastal areas of the northeast. Given this rather wide distribution, Savannah sparrows are an excellent species to examine some of the different breeding strategies across latitudes; namely the reason to nest so far north. Apart from plenty of insects and a bounty of nesting sites, there are a few other advantages to nesting way up north, as well as some unique challenges. Challenge: Breeding season is shorter. If a songbird decides to nest further south, the breeding season begins around mid-May, with insect (food) abundance peaking right around when baby birds begin to hatch. Additionally, as the weather remains favorable and if insect levels are normal, the chance for attempting multiple clutches is better the further south you are. Nestlings can take a bit more time to develop, and to some extent this is limited by the amount of daylight parents have to forage for their young, as well as the extent of insect populations and competition in a given area. As you probably already know, things are kind of cold on western Hudson Bay. And it stays colder for longer. I arrived to camp on May 27th. This is what it looked like. Now, songbirds can handle snow for a little while, but they can’t nest in it. Also, with no leaves and no warmth, there is a lack of adequate cover for a nest and most importantly, no bugs. Songbirds are pretty flexible when it comes to waiting on the right conditions to begin building nests and laying eggs. But they can’t wait forever, and on top of that, Savannah Sparrows had to complete one helluva migration to make it to northern Manitoba. Adults that arrive on the breeding grounds have to establish a territory and find a mate. But with minimal food and a snow-covered landscape, mating takes a bit of a back seat to finding food and personal maintenance. Average nest hatching date in 2018 was July 8th. While this number is likely to change from year to year, it won’t change by much. For Savannah Sparrows that nest in places like coastal Maine, the first nests hatch around first week of June (Wheelright and Rising 2008). This means many birds south of Churchill will have fledglings before eggs even hatch up north. This delayed timing has other implications as well. Most songbirds in the lower 48 will have multiple nesting attempts, particularly if the first one fails. Say a squirrel or blue jay ate your first clutch of eggs on Memorial Day. Oh well. You still have the whole month of June and July to build a new nest, lay some more eggs, and raise some fledglings. But if you nest way up north and didn’t lay your eggs until the end of June, there is a much bigger time crunch. Depending on when the first clutch failed, you may just run out of time to make another nest. Sure, you can try to re-nest and lay eggs in mid-July. But given the roughly three weeks needed to lay, incubate, and fledge, birds are running into a big problem with much less food available by mid-August and rapidly changing weather come September. Advantage: The days are longer, so growth is faster! Seems like anywhere you go as a tiny songbird building a nest and laying eggs, there will be some critter that thinks your eggs are delicious. Nest predation just goes with the territory of being a songbird. At first blush, the sub-arctic tundra has a more favorable lineup of would-be nest predators. Predators like squirrels, chipmunks, raccoons, jays, magpies, cooper’s hawks, and even deer are abundant at lower latitudes (and all will eat an egg or nestling if given the chance). Also, there is a wider variety of nesting songbirds down south, so it behooves predators to cue in on songbird activity. Up north, squirrels, chipmunks, and most other small mammals are a no-show. Canada Jays only hang out near the boreal forest and aren’t found on the tundra. Seems like a win, right? While the variety of nest predators doesn’t quite match that of the south, danger still abounds. Short-tailed weasels roam the area and are expert nest robbers. Ravens might not spend too much time worrying about little songbird eggs when there are shorebird and duck nests to be had, but you never know with corvids. And in some years, Arctic Fox make their presence felt on the tundra. In short: building a nest and laying some eggs always comes with risk. So why study Growth up north? Despite the extra time and energy needed to make it up north, and despite the shorter breeding season, the Savannah sparrows of Churchill (and even further north!) have successfully carved out their little slice of heaven in the tundra scrub. What remains to be seen is how the ever changing northern climate and additional goose degradation has impacted their breeding success, specifically the growth of their young. Goose degradation has already been shown to be detrimental to Savannah Sparrow nesting density in Churchill. My questions were pretty basic but nonetheless important in regards to breeding success. Are individuals able to successfully nest and fledge young in both degraded and non-degraded sites? The implications of this are obvious: if Savannah sparrows can’t fledge nestlings in one site over the other, these degraded areas of tundra and coastal scrub become ecological traps for songbirds. If birds can successfully raise and fledge young, will there be any differences in the growth and development of their young? Growth and development is extremely important in the life cycle of a songbird. Not only does it impact the ability for a bird to even leave the nest and survive on its own without parents, young birds in northern environments must be able to reach the proper body condition by fall to complete (you guessed it!) their first critical migration down south. As we start to answer these and (hopefully) many more questions surrounding growth, development, and success in northern climates, we will be able to see a clearer picture of how shifting environments impact northern ecosystems and the birds that inhabit them. Its fall, so its time to chat about songbird migration in New England! Migration is a particularly vulnerable time of year for songbirds. Birds are facing novel habitats, exhausting exercise, and are encountering more predators and human modified environments. Why do some bird species take this risk? Birds are in search of predictably abundant resources to eat through the winter, and on their breeding grounds food becomes scarce and highly coveted as temperatures decrease . Birds also spend a large chunk of their annual cycle migrating (see below for a Blackpoll Warbler’s annual cycle to see what I mean). So studying how birds are making these journeys, what they are eating on the way, where they go, when, and in what direction is important and can lead to better decisions about how to help them on their way. Understanding how physiological condition (how much fat and/or antioxidant capacity a bird is able to store) influences a bird’s behavior can help us to better understand their needs during this susceptible time. Further, physiological and behavioral actions during spring and fall migration can have consequences that spill over into the winter or breeding seasons (called carry-over effects). We are in the midst of a manipulative field experiment that is trying to tease apart whether fat stores and antioxidant stores are important drivers of decisions birds make during their travels. But before I start talking just about birds and how cool they are, I want you to take a second and think about an animal that embodies athleticism to you. Did you think of the sprinting cheetah, or the fast swimming sailfish, or maybe the remarkable dive of a hunting peregrine falcon? Well, of course you would be right! All those species are incredibly fast athletes. However, when I think of any sort of endurance athleticism in the animal world, I tend to think of animals that are migrating – especially migratory birds. Every year thousands of birds make long migrations around the globe, moving from areas of declining resources to areas of abundant resources. And, these birds fly hundreds to thousands of miles in the process, which is a crazy feat of endurance exercise. Among migrating birds, there are definitely some rock stars. The Arctic Tern is pretty famous (to us bird people) since it flies almost 60,000 total miles during migration. As is the Bar-tailed Godwit that migrates nonstop from Alaska to New Zealand or Australia, covering more than 6,000 miles in about 8 days of continuous flying (which is exhausting for me even to contemplate). However, although some birds are able to migrate in one flight, birds have many different strategies to help them travel these enormous distances and there is a lot of variation in how these journeys are made. First, there could be variation in the routes a bird may take - in North America a songbird breeding in the arctic and wintering in South America may take a completely overland and direct route to get there, or they could fly east and then down the coast and across the gulf or straight across the ocean. Possible migratory routes birds can take on their way south. Second, most migrations are not non-stop flights, and therefore, during migration, short periods of endurance flight are traded off with periods of feeding and rest at stopover sites. There may be many stopovers on a bird’s migration from their breeding location their wintering location. Migratory stopover sites are crucial for birds to rebuild energy stores, and the time a bird spends on a stopover can influence the timing and success of its overall migration. Additionally, during flight, birds have an elevated metabolism leading to an increase in the production of a byproduct we call reactive species. Reactive species can cause damage to cells, tissues, or DNA if not balanced by antioxidants**. Luckily for the birds, during the fall, there are a ton of seasonally abundant fruits around that are full of dietary antioxidants and fats. Birds that normally eat insects during the rest of the year generally switch to eating these fruits during migratory stopovers. However, the quality of stopover sites and the amount of fruit available to birds varies among sites and across a migratory season. We were curious about whether birds that have more fat and/or antioxidants in their diet can spend less time on a stopover site, and whether they are more likely to depart in a seasonally appropriate (southerly) direction. To examine these differences, we headed out to Block Island, Rhode Island, an offshore stopover site that is popular for migrating birds and performed a field experiment. We caught four species of birds (Blackpoll Warblers, Hermit Thrushes, Red-Eyed Vireos, and Myrtle Warblers) that varied in their migration patterns, and manipulated their physiological condition. Looking at multiple species of birds will allow us to compare how important condition is for birds with different migration strategies (land-based vs. over the sea) and migration distances (short vs long). Myrtle Warblers (Setophaga coronata coronata), migrate shorter distances than many of the other species passing through Block Island in the fall, and winter farther north than any other wood warblers. Hermit Thrushes (Catharus guttatus) are medium distance migrants that travel from Block Island to winter in the southern United States and Central America. Red-Eyed Vireos (Vireo olivaceus) are long-distance migrants that regularly stopover on Block Island during the fall. After leaving Block Island they are more likely to migrate overland until they reach the Gulf of Mexico, which means they will probably stop many more times as they travel south. In contrast, after leaving Block Island in the fall, Blackpoll Warblers (Setophaga striata) make an insane journey out across the open ocean for 3-5 days of non-stop flight before reaching a wintering destination in the Caribbean or South America. We used mist nets to capture these four species and and then kept them in an outdoor aviary for a couple of days to manipulate their physiological condition. Once caught, we either gave the birds a diet rich in fat and/or antioxidants (we called this the ad lib diet) or a diet without extra fat and/or antioxidants (we called this the maintenance diet since birds, well, maintained the weight that we caught them in). We wanted to fatten the birds up (ad lib diet) and give them a lot of dietary antioxidants so that they were in better condition to simulate birds on a stopover site that would be abundant with fruits. We contrasted that diet treatment with the maintenance diet to simulate birds that wouldn’t have as much access to fruits on stopover. We predicted that birds that were able to stuff themselves with fat and antioxidants would be in better condition and would be more likely to migrate sooner and, potentially, reach their wintering grounds sooner than birds that were unable to do so. We also took blood samples to look at their antioxidant capacity. A bird’s blood can tell us all sorts of levels of circulating antioxidants or other metabolites, kind of like when you go get checked for your cholesterol at the doctor. We predicted that birds given dietary antioxidants would have increase their circulating levels of antioxidants during captivity. After several days in captivity, birds on the fat rich diet had gained a lot of fat, where birds on the maintenance diet were still in the condition that we had caught them in. We then attached small radio-transmitters called Nanotags to these birds. Each nanotag sends out a unique signal every 10 seconds that can be picked up passively by receiving stations in the MOTUS network. We built one of those receiving stations on Block Island, but it was a part of the network of towers that extends from Canada down into South America. If any of our tagged birds fly along the Atlantic flyway then there is a good chance we’ll know about it. Nanotags will help us determine whether birds on an ad lib diet or one that was given dietary antioxidants can leave Block Island sooner and in a more seasonally appropriate direction than those on the maintenance diet or ones not given dietary antioxidants. Linking behavioral decisions and physiological condition of songbirds together can help us to understand the types of habitats and food resources different bird species need on stopover sites. In turn, that could help to determine how we can best conserve those areas, or how we can restore them by planting native fruits and berries (see this helpful guide on what to plant!) to help these incredible athletes on their way. **Antioxidant Definition: Animals have a multifaceted antioxidant system made up of endogenous antioxidants, micromolecular sacrificial molecules and dietary antioxidants that work synergistically to protect against oxidative damage (from those pesky reactive species). For birds in migration, the relationship between reactive species production, antioxidant protection and oxidative damage is not straightforward, and various aspects of the antioxidant system may respond differently depending on the type of damage, the duration of flight or the physiological state a bird. Dietary Antioxidants: Antioxidants produced by plants and consumed by animals in their diets. The two broad classes of dietary antioxidants include lipophilic antioxidants (vitamin E or carotenoids) and hydrophilic antioxidants (vitamin C or polyphenols). In this study we specifically examined polyphenols. If you did enjoy reading the post then like & share using the icons at the bottom of the page! Read my phone interview with Todd McLeish, professional science writer and communicator. Todd has written hundreds of articles and 4 books focusing on the natural history of wildlife and some of the things that threaten them. During our conversation, Todd talks more about his work and provides you science communication aspirers some tips for achieving your goal. Kristen: Hi, Todd. Thanks for taking my call. Todd: Oh, I'm glad to help. I don't mind at all! Throw your questions at me. Let me know what I can do for you. Kristen: You have written many articles, essays, and books. If you had to condense it all, and boil it all down to one central them what would it be, or could you even do that? Todd: Well, I'm an animal guy. That's mostly what I'm interested in. So, that's the subject matter that I try to focus on. When I'm writing my books I pick a subject that I can have a fun adventure with, but it's mostly about conservation of wildlife. That is really the main focus of what I like to write about. Kristen: Yeah, reading some of your work, it did seem to me that maybe one of your motivations was to raise awareness about species that could use our help, help from humans. Todd: Okay. So, from that perspective you're absolutely correct. I mean, so again getting people to think about these animals, and to appreciate them, and to want to protect them. Kristen: Yeah, I think that's a very admirable goal. Todd: Yeah, and that's, I mean that's what my life is all about. I love to go out and look for wildlife because wildlife is cool, and I'm excited about it, and I want to be able to share that excitement with others. Whether it is from my stories, whether it's through my books, whether it is from leading nature walks, whether it's from speaking about these subjects on cruise ships and wherever else anybody else wants to hear me. Kristen: Do you think that this excitement that you feel about this topic is an important piece of this communication career that you're building? Do you think that enthusiasm helps you get your messages across? Todd: It absolutely does, and I'll tell you to be honest, one of the things that I do is I give a whole lot of public presentations for pay. I'm upbeat, I tell funny stories, I am excited about these animals and wanting to protect them, and that enthusiasm comes through certainly in my presentations. It's sometimes a little bit hard to get that enthusiasm to carry through into books, you know, but that is also pretty key. To generate some enthusiasm with your writing, and get people were reading to say, oh, this is a cool animal, and gosh we should do what we can to protect them. Kristen: Right, so your audience that you're writing for are generally non-scientists. Is that how you would sort of describe them? Todd: Yeah. I generally describe my audience as Audubon society members, as discovery channel watchers, as armchair travelers, general wildlife enthusiasts. People curious about the natural world around them. Kristen: And do you have any way to gauge who your consumers end up being, like if you're hitting your target audience or not with these books? Todd: That's a hard question. Kristen: Yeah, It's a difficult thing I think to have a sense of. Todd: It's an absolutely difficult thing to measure, and I'm not entirely certain. I know that when I have a book come out I give all these presentations, and so I'm able to see my audience when they show up to my presentation. Kristen: Right, it's really nice to have that physical feedback. Todd: It absolutely is. Being in the presence of my readers is a big help to getting a sense for, am I doing it right? Should I have done something differently? Are they getting it? And so far it seems like I'm doing okay. Kristen: Wow, that's awesome. Do you have specific techniques from your communication degrees that you still go back to and use? Do you have really important ones that stand out? I mean coming from a science education, I haven't had that formal training at all, so I'm just curious what sort of tools you rely on? Todd: Well, I'll be honest with you; I didn't take many writing classes. Todd: So, I got my writing education mostly by reading and paying attention to what a well-written story looks like. And writing. That's how I essentially learned to write is by reading good writing. Kristen: Yeah, essentially immersing yourself in your field. Kristen: If you were speaking to the fellow graduate students in our public engagement with science class, what pieces of advice would you offer for us who might be pursuing a career in science writing? I'm hearing it might be that a lot of it comes from experience, but based on your experience, what can you offer? Todd: We're sort of in a reverse situation, whereas I'm the non-scientist interviewing the scientists, and you guys are all scientists yourselves. So, I suppose the key really is going to be that you need to bring the science down to a level the non-scientists can understand. In order to keep people engaged in science, who aren't scientists, you need to bring them little nuggets of science that they can digest. Todd: The other thing that, for me, is I wrap my science in my adventures. A key element is I go out there with the biologists and help them with their research, and that means I have these first person adventures to be able to share. Those first person adventures are able to keep people engaged in the story long enough that I can share some hard science as well. Kristen: Yeah, so frame things like a story, use analogies and just talk to your grandma. Todd: Talk to your grandma, yes! Kristen: I love it. Thanks so much. I really appreciate your time, Todd. Todd: No problem at all, glad to help. Todd's newest book is now available! What can we learn from animal home ranges? Integral to all of our daily, monthly, and yearly activities is the locations where we perform our tasks, be they recreational, professional, or personal maintenance. We don’t necessarily have to define ourselves based solely on our locations, and even though Dave Matthews would probably disagree, where we are can certainly provide plenty of information about our lives. Birds are no different. They go to certain locations to sleep. They go to certain locations to eat breakfast. And even though birds don’t have an economy or traditional ‘jobs’, they still have work to do. Thus, if we can figure out where an individual bird is, and better yet, why that individual is there, we can start to piece together the rich tapestry that is the life of a bird. And with more information about where birds go and how they get there, conserving habitat and populations becomes that much easier and more effective. First big point to establish: this is all about tracking individuals and then using that spatial information to answer a variety of questions about birds. Tracking animal movements at the population or species level is possible, albeit with slightly different methodological frameworks, but we can save that for another post. There are many ways to track individual birds, and the methodology is usually defined by the questions you want to answer and the technology available. This is quite a robust topic with a deep history, but alas, we must contain the ever-growing urges of scientific curiosity bubbling inside and focus on the overall purpose of tracking individuals. What kind of information can we gain, and what can we say or do with that information? Let’s look at one of the basic and fundamental measurements in spatial ecology - an individual’s home range. The simplest definition of a home range is the space where an animal lives. Think of the daily routine example from above. Where we sleep, eat, and work exists within a certain space. Usually this space is contained within a town or city, and within that space would be your house, your office, your favorite places for recreation. Likewise, a bird’s home range is the space that contains the locations where it forages, nests, preens its feather, and sleeps. To generate a home range, the first things we need are the locations in space and time of an individual (think GPS points on a map). Next, we need to choose a period of time we are interested in. For migratory birds, this could be a variety of periods throughout the year that each encompass different ecological behaviors and have different implications. For example, the breeding season, roughly May-August for North American birds, would be the time to construct a classic home range that contains a nest location, feeding areas, and locations for protecting young from predators. To properly construct a home range, we need to make sure we have enough locations that we are gathering (or sampling from) that are representative of the bird over different times of the day and over the entire period of interest. Once we have our representative locations, we can plot them on a map and build the home range. But enough with the words, Steve, give us an example! I’ve been studying towhees for the past two years in an effort to assess the effectiveness of statewide early successional/young forest management strategies for songbirds. Towhees are perfect representative of young forest or shrubland birds. Think of all the thorny, scrubby, bushy places you avoid on a daily basis…this type of habitat is perfect for towhees, and it’s in short supply in southern New England. Gathering spatial and nesting data on towhees and other shrub birds in Rhode Island will help us understand how (and if) these animals are using state-managed forests. Let’s look at the locations of an adult male Eastern towhee between June and August 2016 in Rhode Island. This individual was tracked after he successfully fledged 2 young, and was subsequently caring for his fledglings. Here are some of his GPS locations mapped out. Already this is pretty cool to visualize. Just from seeing his points in context with aerial imagery is neat on its own. Also, the imagery provides a general context for the type of forest towhees are hanging around. But let’s create his home range and see what else we can find out. The simplest way to do this is by a method called ‘Minimum Convex Polygon”, or MCP. Essentially, this entails drawing the smallest box possible around all of our sampled points. Cool! Already we can look at this map and say some things about this bird’s life. For instance: the size of this polygon is just about 1 hectare, which is roughly the size of a football field. Thus, this particular bird seemed to consistently spend a lot of time within a hectare-sized area while his young slowly grew up over the summer. But this whole straight-lined polygon thing seems a bit…unnatural. What are the odds that this towhee didn’t stray outside the blue lines on the map, or put another way, the likelihood the summer home range of this bird doesn’t include space beyond these lines? Fortunately, scientists have devised other ways to estimate home ranges beyond MCPs. A common method to account for the likelihood of an animal occurring outside this arbitrary polygon is by using kernel density estimation, or KDE. These methods can be a little complex and depend on many factors including sample size (how many points did you gather per bird? ), autocorrelation (the influence of one location on the next), and bandwidth estimators (for statistics!). I know what you’re thinking: we have reached the section of the article filled with multi-syllabic words that sound like math and are intentionally complex, and the only people who understand this are folks that like tofu and listen to jazz. Fear not. The extremely short explanation of KDE is that by using the distances between the sample locations themselves, one can more accurately estimate the probability of space used by an animal, and thus build a better home range. So let’s rebuild this towhee’s home range using KDE. Think about the habitat/environmental questions we can answer with this home range. What if I wanted to know how much towhees utilized previously managed forest clearcuts? Well, first I can add this GIS layer that outlines areas that were previously managed by the state. Sweet! Then I could overlap with the home range, and calculate a quick percentage (~65%). Seems like this critter was happy to use a regenerating clearcut to raise his young, which makes a whole lot of sense. Early successional forests are full of densely packed shrubs and young trees. This provides excellent cover for vulnerable, recently fledged baby birds. We could also overlay the different type of forests in and around this bird’s home range in order to get a better sense of the immediate landscapes around towhees. As in most research, if we can gather similar data and create home ranges for a larger sample of towhees, we can more confidently use this data to answer some really interesting questions about our ecosystem. Think of the possibilities! -Does proximity to developed areas or edges influence survival? -Do females use more or less space, or do birds with our without young use more or less space? -Does distance to other managed forests impact spatial movements? The possibilities are endless! These are the types of questions I’ve been working on with these little songbirds, and with a rapid increase in tracking technologies, all sorts of spatial questions are starting to be answered and will be addressed in the near future. But a home range is always a good place to start! Kristen holding a young Eastern box turtle (Terrapene carolina carolina) too small to carry a tracking transmitter. It was an August morning on Cape Cod, Massachusetts, but instead of lounging on the beach with tourists I was gearing up to track down my Eastern box turtle friends. Eastern box turtles (Terrapene carolina carolina) are a beautifully patterned land dwelling turtle. Their populations continue to decline due to habitat loss, collection as pets, and road mortality, and they are globally listed as vulnerable to extinction. My task for the summer was to find turtles in their breeding habitat, glue a radio transmitter to their shells, and use that radio signal to track them to understand what habitat types are most important to protect. I followed turtles around all summer long, and it may surprise you that they do move extensively during their breeding season! This August morning began like any other day in the field. It was time to track turtle 910, so I turned my dial to that frequency and headed towards its favorite place. This turtle, along with two others, frequented a spot that seemed to be a box turtle oasis. It was a small rocky depression lined and protected by large granite boulders and filled with green shrubs and young trees. It was located at the other side of a field roughly half the size of a soccer field. I stood at the edge of the field, pointed the antenna at the oasis, and picked up the turtle's signal! Great, just as I had expected. I strode confidently through the tall grass reaching up my torso with one thought, turtle 910. Whoa! Some...thing shot its head up through the grass just in front of me and snapped me out of my tunnel vision. I was so disoriented and startled that I couldn't recognize what this beady-eyed creature was. It charged directly at me, and that's when I realized I was being attacked by a wild turkey. "Forget turtle 910! ", screamed my internal dialog. I ran as fast as I could in fear of that bill. I didn't look behind me until I was completely clear of the field, and to my delight the turkey had remained in the grass. To the turkey's delight I was no longer in the field heading straight for him. I learned first hand the valuable lesson that Jurassic Park (The Lost World) attempted to instill in me early on. In case some of you also missed it in 1997, I pass that message on to you: Don't go into the long grass (click here for video clip)! Yes, I now see turkeys as bloodthirsty velociraptors. Maybe not such a stretch since all birds are dinosaurs; birds today are reptilian descendants of an older group of dinosaurs, the therapods (I'm not too far off...velociraptors are therapods too!). Physiology is the study of how animals work and perform everyday functions like breathing, walking, and maintaining a normal body temperature. In many species, animal physiology responds to environmental conditions including the amount of available water, the temperature, and the time of year. A general rule is that when the environment changes then animal physiology responds. It is important to note that changes in physiology and behavior often occur together. For example, a bird readying itself for migration will eat a larger amount of food in order to double the size of their fat stores that are crucial for providing fuel during long-distance flight. This behavior would be impossible if their physiology was inflexible, but luckily they remodel their digestive system to cope with processing all of this food. An alternative tactic that animals use to fit into their environment is that they change only their behavior so that they experience a constant set of environmental conditions, and as a result they avoid changes in their physiology. Aquatic turtles use this strategy to keep their body temperatures fairly constant by switching between basking themselves in the hot sun and plunging themselves in the cooler water. Whether or not animals change their physiology, their behavior, or their physiology and behavior depends on the species and on their environmental situation. For this post I'll summarize the types of changes in physiology that this blog will focus on. Physiology can change on a short-term timescale soon after their environments have changed, and these changes are reversible. This happens to us. Standing outside on a cold winter day in thin mittens, it only takes about 30 minutes to notice our hands are cold and beginning to hurt. In this situation, our blood flow has been rerouted to our center to keep our important organs warm. During the winter in North America a specific species of frog, the wood frog (Rana sylvatica), buries themselves beneath the soil in preparation for freezing temperatures. These frogs are unable to keep their body temperatures high enough so that their organ systems could properly function. These frogs embrace that shortcoming and allow their bodies to freeze nearly solid immediately as ice forms around them in order to survive the cold. Special physiological adaptations protect their organs during this freeze and help them to completely recover as soon as the temperatures warm and ice disappears. The Dr. Richard Lee & Dr. Jon Constanzo lab investigates the physiology of these amazing frogs. An overview of Dr. Lee & Constanzo's research can be found here. Spring is here and wood frogs are emerging from their frogsicle forms NOW! If you are in Canada or eastern North America then keep your eyes peeled and ears open. Animal physiology can change on a long-term scale either days, weeks, or months after their environments have changed, and these changes are reversible. We can relate to this too. Taking a long walk on the first scorching day of the summer we feel drained. After experiencing this heat day after day it seems easier to take this same walk in mid-summer. Our bodies adjust to the heat with repeated exposure, and as a result we can better endure hot weather. Songbirds that stick around for cold winters rather than migrate to tropical regions have to change their physiology so that they can stay warm enough to properly function and survive. Winter resident birds like the Northern Cardinal (Cardinalis cardinalis) keep warm by enhancing their ability to generate heat through a tactic similar to mammalian shivering, but without the muscle trembling that we experience. They also increase their fat and feather layers in the winter to improve insulation which is crucial for keeping that extra heat that they produce inside their bodies. These physiological adjustments do not happen after the first freeze or even with the first snowfall, rather it takes weeks at cold temperatures for birds to transform their bodies into fat, fluffy, heat generating machines. The Audubon society covers how birds stay warm in more detail here and Dr. David Swanson's lab focuses much of their research on cold hardiness. Spring is here, and despite the recent snow, cold hardy birds like the Northern Cardinal and Black-capped Chickadee (Poecile atricapillus) are losing fat and shedding fluffy feathers in preparation for the breeding season. Mammals like the 13-lined ground squirrel (Ictidomys tridecemlineatus) are adapted to hibernate during harsh winters when temperatures are below freezing, days are short, and food is unavailable. The internal clocks of these mammals filter through the environmental cues (e.g., temperature, light levels, and food availability) to control physiology and make hibernation possible. Ground squirrels lower their body temperature (and actually feel cold to the touch! See above picture) and slow their metabolism* (defined below) so that they are barely using or producing any energy. This means that their heart rates drop from 200 beats per minute to 20 beats per minute. Their biological clocks use similar environmental cues to stimulate their metabolism and rouse them from hibernation. National Geographic gives more overview about hibernation here, and Dr. Jim Staples investigates the metabolism of hibernating ground squirrels. The onset of Spring is inciting hearts to flutter and, as Owl would explain to Bambi and Thumper, squirrels are twiterpated. If you live central North America then go searching, and don't forget to count their lines. Animal physiology responds to environmental changes either on a short-term scale, long-term scale, or periodically in a repeating pattern. These changes in physiology can be difficult to observe firsthand. Although, behavioral changes can often act as a flag that alerts us to unnoticeable changes within an organism. Next time that you observe a behavioral change in one of your favorite critters I challenge you to think about the types of physiological adjustments that your animal might require to make that behavioral change possible. *Metabolism is a concept we will continue to revisit. This is how I like to think of the concept: All organisms require energy to perform their daily activities, and this so called fire for life is the product of chemical processes collectively referred to as an organism's metabolism.